Both Atlantic and Pacific cod are cold water fish that produce a white, very flaky, and moist meat when cooked. Because of the delicate flaky flesh, cod is often prepared in stews, creamy brandades, or made into fish cakes. It is also battered and deep fried for fish and chips. Cod doesn’t hold up that well on a charcoal grill. But, it does cook nicely on a George Foreman Grill where its moisture is retained. 3 ounces of cod is approximately 75 calories, .6 grams of fat, and 17 grams of protein. Cod is very low in fat compared to some other fish species. B vitamins are found in significant amounts in cod. B vitamins are essential for healthy skin and hair, and for keeping your nervous system functioning optimally. Phosphorus and selenium are both minerals that are relatively prominent in cod fish. Selenium is an antioxidant that helps to fight those pesky free radicals that cause disease and premature aging. Cod is the perfect fish for a taco. The first ingredient list in this recipe is for the fish. You can proceed with the rest of the recipe to make the tacos, or just eat the fish just as it is with your own favorite sides. The second ingredient list is for the taco toppings over the fish inside the tortillas. 1. Prepare the fish: Cut the fish into equal pieces, say 3” square. No need to be exact. Combine the fish with the EVOO, lime zest and juice, garlic, paprika, and salt to taste in a medium bowl. Cover and refrigerate while you make the cabbage. 2. Prepare the cabbage: In a medium bowl, whisk the lime juice, honey, and oil. Add the cabbage, scallions, and jalapeno. Season with some salt to taste. Mix this all together and let this sit for at least 15 minutes or longer. 3. Heat the Foreman Grill to high. Cook the cod on the hot grill with the top closed for approximately 3 minutes. Check with a fork to see if it is white and opaque inside. Remove the fish to a plate and wipe the hot grill with a folded paper towel (carefully) to clean. 4. Warm the tortillas, as many as will fit at a time, on the grill. It’s ok if they overlap. While they are warming, prepare the avocado strips. 5. Assemble by placing a tortilla on a plate, then some fish, topped with the avocado, and finished with the cabbage. Fold over and enjoy with plenty of napkins. As mentioned above, you can skip the taco and slaw part of this recipe and just make the cod, especially if you are in the mood for a quick meal. If not making tacos, consider serving the cod over a bowl of quick cooked, steaming rice with some scallions and fresh grated carrots. You can eat this with chop sticks while chilling in front of the TV after a long day. Cod is really one of the most versatile fishes to work with. Like tofu, it absorbs the flavors of whatever it is combined with. 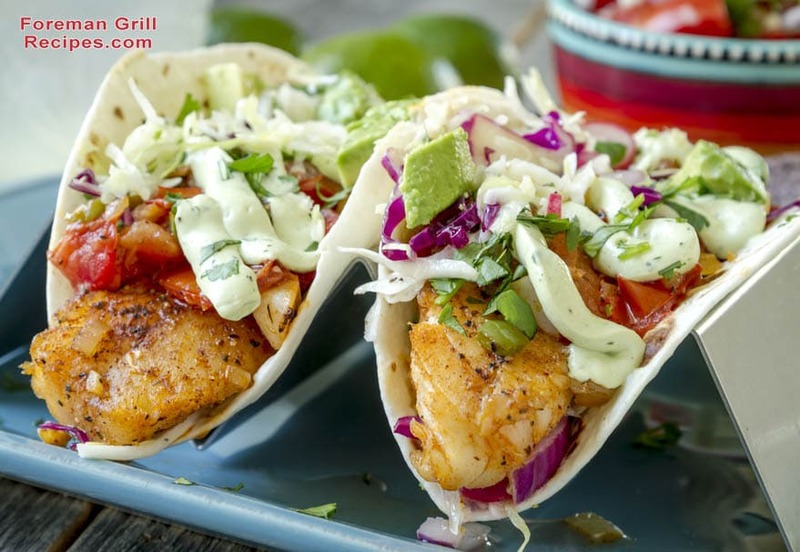 While I am partial to it being grilled or pan seared just as it is, don’t be afraid to try some of these ideas that you can cook on the Foreman grill with either the grill plates or the flat griddle plates. Simply adjust the cooking times in these recipes. Less time is needed on the grill. When working with cod be mindful of the delicacy of the fish. By cooking it on an indoor grill with a top heating element, you don’t need to fuss with it by turning or flipping, which could cause it to break apart. Bon Appétit.